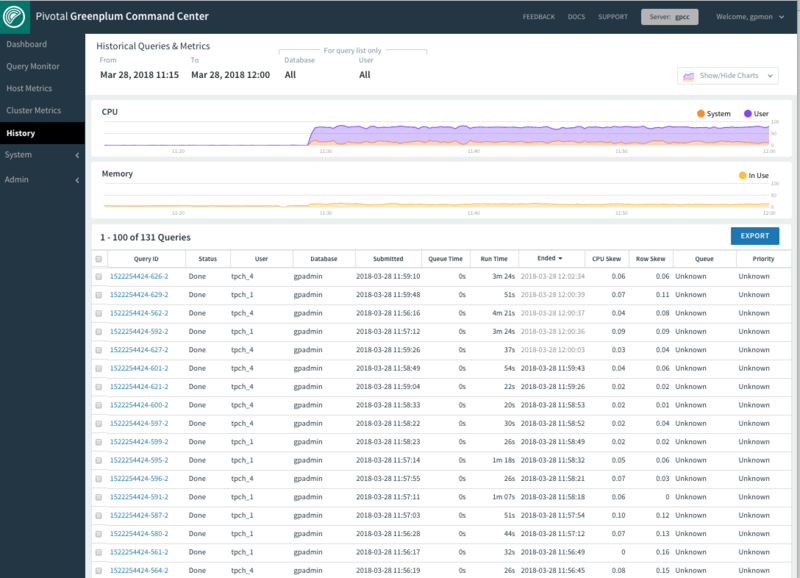 The History page allows you to display system metrics and queries executed during a specified time period. Queries may also be filtered by database and/or user. Note: The History data is not derived from the real-time metrics displayed by the Query Monitor and Query Detail view. History is collected and saved in the gpperfmon database by the gpmmon and gpsmon agents. Variations should be expected due to the different data collection methods. Set the time period to display by entering dates and times in the From and To date and time fields. You can enter dates by typing them into the date field or by choosing from the pop-up calendar. Enter 24-hour times in HH:MM format. To restrict queries that display in the query table at the bottom of the page, enter a Greenplum database name in the Database field, a user name in the User field, or both. Filtering by database and user only affects the queries displayed in the table. The metrics displayed in charts include all activity during the selected time period. Click Search to display results that match your criteria. You can click and drag on a chart to zoom in on a time range. Click Search to update the query list and charts to the selected range. Scroll charts left or right by hovering over the edge of the chart and clicking an arrow. Click ‹ or › to move in half steps. Click « or » to move in full steps. In the query list, select or hover over a query to highlight its queued and run time in the charts. Charts of the following metrics are available. Show or hide them at any time with the checklist at the upper right of the view. The percentage of CPU used by system processes and the percentage of CPU used by user processes. The Query table displays queries that were active during the specified time period, including queries that started before or finished after the specified time. However, queries that are still active are not included in the table; these queries can be viewed on the Query Monitor page. An identification string for the query. In the Console, this looks like “1295397846-56415-2”. The amount of time a query spent in the queue before it was executed. The amount of time the query required to produce a result. The time the query completed or was cancelled. Each query inherits the priority assigned to its resource queue. For more information about Resource Queues and Query Plans, refer to the Greenplum Database Administrator Guide.